Cumin seeds - 1/2 tsp.Ghee - 1/2 tsp. Pressure cook toor dhal, mash it and keep aside. In a utensil, squeeze the tomatoes, salt, slit green chillies, rasam powder, and hing , add a cup of water and bring it to a boil till the raw smell of the rasam powder goes. Now add mashed dhal, two more cups of water and mix well. Boil till frothy. Turn off the stove. Squeeze the juice of 2 lemons. Mix well. In a kadai, heat ghee, temper with mustard seeds, cumin seeds and curry leaves. Add it over the rasam and garnish with chopped coriander leaves. 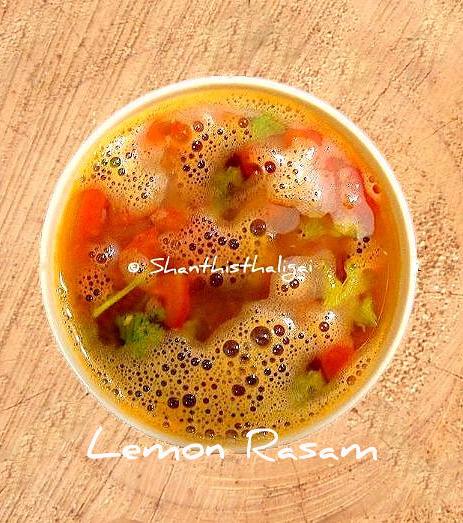 Your spicy, tangy lemon rasam is ready. I love rasams. This version looks yummy and colorful. Love rasam on any day.This one looks so good feel like drinking it! Tangy and tasty looking rasam. Compliments with the awesome pics. Even i do the tempering with ghee Akka, super rasam. Landed here while searching for easy rasam recipes. This turned out super. Thank you!